Home > “Its only weed”. Rethinking our response to young people’s cannabis use. O'Brien, Karl and Foley, Brian (2017) “Its only weed”. Rethinking our response to young people’s cannabis use. Dublin: Ballymun Youth Action Project. 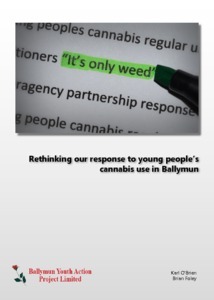 The origins of this report arose from the Equal Youth Initiative in Ballymun. Equal Youth aims to develop a model of inter-agency co-operation between service providers supporting young early school leavers between the ages of 16 and 24. In recent years, it had been noted that a particular profiled group of Equal Youth clients were not maintaining appointments and those who did attend were demonstrating low levels of motivation in key-working sessions with practitioners. The impact of this on retention and progression rates for this target group was concerning and needed further analysis to determine what factors were contributing to high drop off rates or poor progression options for this particular cohort.